LookingCare is an innovative health platform founded in 2012, communication specialists to offer high quality and quick healthcare services in Turkey for both patients and their relatives abroad. On this platform, pioneer hospitals and healthcare providers specialized in various therapeutic fields are presented; Turkey’s advanced infrastructure and quality of service in field of health are emphasized. 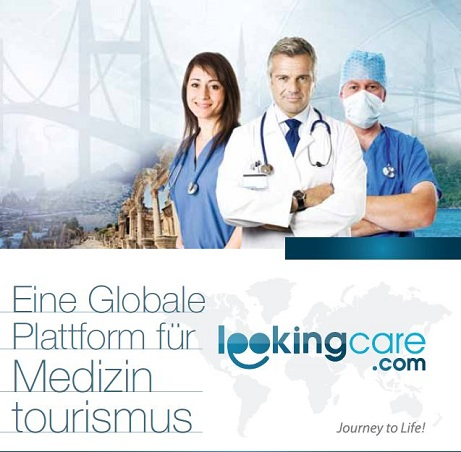 LookingCare, actively carries out international projects in order to bring Turkey to its well-deserved position in health tourism as pointed out by WHO amongst the countries of high potential in this field. Our team of medical specialists at LookingCare provides guidance service for the patients to access appropriate and effective treatments 24 hours a day, 7 days a week. Patients and their relatives can enroll in our system on www.lookingcare.com and benefit from the information service free of charge. LookingCare’s responsibility is to change and continually improve the way people access to healthcare services in Turkey. Our vision is to be the most trusted medical tourism platform where people can come to learn about various treatment options that our doctors provide through careful studies specifically for the indicated diseases; so that they can have the freedom to choose. As we move towards our goal we will inspire our representatives to be the best they can be and help people be healthy. Connect the patients with medical partners (physicians, specialists, hospitals). The company is dedicated to provide excellence service care in a customer-focused, service-oriented environment. LookingCare seeks to supply the cheapest and best treatment options in other words, we strive to serve and deliver the BEST PATIENT CARE in Turkey. The company provides information on doctors and hospitals, obtaining an evaluation from your medical team, booking an initial consultation, and scheduling your surgery. Our stuff also help with booking flights and accommodations. When you arrive in Turkey, they will be waiting for you at the airport and all necessary transportation will be arranged. The patients who benefit from LookingCare expertise, are provided with the opportunities of accessing the hospitals which offer the best treatment for affordable prices as well as enjoying Turkey’s historical and natural beauties for the ones who wish to have a trip after the treatment. LookingCare ensures to get a special discount up to %30 percent in many hospitals and doesn’t request any fee from patients. We provide professional, confidential, customized job searches for physicians, mid-levels and allied health professionals. Your privacy is important to us. All information given to us is deemed confidential. We will not present candidate information or Curriculum Vitae (CV) to clients or anyone without your permission. There is never a fee to candidates seeking jobs for our placement services. Upon joining our network, your CV will be connected with a specialty recruiter who’s focus is finding you the right opportunity for the long run. We offer our expertise every step of the way and listen intently to your personal and professional needs– all to ensure a successful placement. By means of professional healthcare consulting, we create operational value whether at your corporate and regional offices, individual facilities or with specific service lines. We improve your facility and international patient services department management through hospital consulting to help ensure optimal patient care and financial stability. Further than connecting patient and the healthcare provider, LookingCare.com makes a contribution for improving sectoral processes by rigorous monitoring throughout the treatment period. We provide a dedicated, central point of contact for patients who benefit the expertise of lookingcare which helps to improve patient compliance. Using our data based on experiences of lookingcare patients, we conduct a comprehensive analysis and data review of your organization’s current culture and its impact on the patient experience. This report serves as the foundation for your action plan to move your culture to where it needs to be.